1. Air Malta. On a recent flight the air hostesses reminded the passengers to switch off their phone during take-off Gangnam Style! Yep, that’s right. They did that weird, little dance that has taken over the world, through the narrow aisle and even had a pilot stand in as their in-flight PSY. 2. Air New Zealand. The Kiwi airline made a flight safety video with air crew dressed up as characters from the Hobbit movie and even featured a cameo by Sir Peter Jackson. 3. 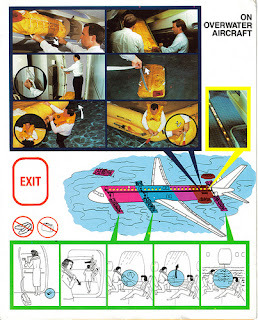 In December 2011, Cebu Pacific showed passengers who travelled around Christmas time a video of dancing air hostesses while demonstrating how to put on the life vest in case of emergency. 4. An oldie as well. In 2009 Thomson showed a safety video using children acting as flight attendants. Very high cuteness factor. 5. Air New Zealand again. In 2009 the Kiwi national airline featured a safety instruction video that featured body painted air crew for their domestic 737 services. Yep, that's right. They were wearing nothing but a painted on uniform. They are funny and entertaining, however I don't know how effective these videos were. Especially when you're trying really hard to ignore the NZ crew's private bits.